Luckily, admitting it is usually the first sign that I’m about to fight my way out! Since I’m injured I’ve got a bit of a handicap this time, because usually my best way to combat depression is running. You’ve all heard it, you’ve probably even said it: Running is Cheaper than Therapy. But not only is it cheaper, it may even be better! Depression has been a nuisance in my life since I was a little kid struggling to cope with a violent family tragedy. Like many kids, my brain went into defense mode and blocked out the memories until somewhere around the age of 13, when I started asking questions. The reality I discovered was a shock to my system, jolting me back into grieving over the loss of my father. Then suddenly, inexplicably, I started running. What’s strange is that I was not an athletic kid. I was an overweight gym-class-dodging book nerd who suffered constant heckling from other kids and begged for a viola for my birthday–sports were not exactly my thing. But somehow that summer I got it in my head that come hell or high water, I would join my high school cross-country team. The only requirement was capability of running three miles without stopping, so I found some old running shoes and out the door I went. 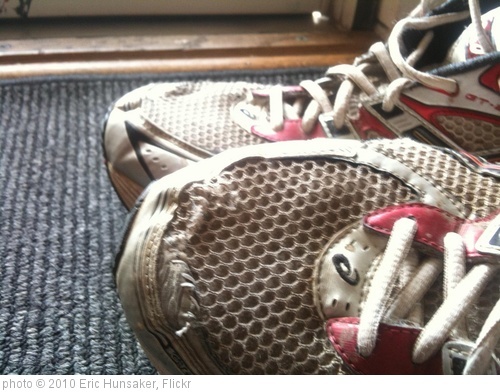 My first running shoes were a beat-up old pair that Salty had left behind from her own high school cross-country career. Running changed everything. Suddenly the reality of my family situation didn’t seem so unbearable. Suddenly life was simpler; it was just as easy as running until I couldn’t anymore. Then I would walk until I felt good enough to run some again. Suddenly I had a time set aside every day to clearly think about my sorrow and piece together how I had become the person I was. Running made me realize that I had the power to change that person-over the course of a few months I changed from a gym-class-dodger to an athlete! Things got really bad again when Hurricane Katrina tore my life into pieces–I told you that story. Once again, running came to my rescue and helped me regain control over my life. The last time I had a dark time was around Christmas 2009–again I was unemployed for a long time and was struggling through a weird break-up. I lost interest in food, in dance classes, in finding work and even running, but luckily I was on a training plan for my second half-marathon, so my phone beeped at me every day to get outside and run. I ran while sobbing so hard I doubled over almost every hundred meters from the physical strain. I ran crazy fast speed workouts on the hills in Prospect Park to punish myself for being so sad. Once I accidentally ran off a trail and fell because I couldn’t see through my tears–but I got up and kept running, and running kept me going. And by the time I finished my race I was over that boy and working on a new job. This time I’m down with unemployment blues, heartsickness, loneliness and running injury woes. I know, I know…worse things have happened to better people. Just call me Spoiled Cinnamon with my sad little first-world problems and I’ll cry you a river. Look, I know they’re pretty weak problems but they’re dredging up a lot of abandonment and self-worth issues from my childhood, okay? For me, and for others, the best running therapy is done solo. A long solitary run is time set aside to think about your problems and work through them. When you’re off by yourself on a desolate path somewhere you can give yourself permission to cry about things and yell at yourself and yell at other people who aren’t there. You can even run away into the woods and scream (just make sure you don’t scare anyone). You can let physical exertion take the place of your emotional anguish for a little while – hopefully long enough to mentally sort through the tangled knot of negative feelings. The most therapeutic characteristic of running for me has always been that it gives me goals to work toward so I can focus on something positive. There’s always a race out there I can train for–but not this time. This time an injury has me on the sidelines, nervously attempting some slow runs with my club here and there and walking through the rest of my workouts. I know I’ve got to get better physically but it’s hard to take time off from running when I also need to get better mentally! Krissy Moehl, one of my running heroes, says “there isn’t a problem a long run can’t fix, just sometimes the run has to be longer than others.” Feels like I’m due for a 100 miler. Have you used running to feel better in a time of sadness? You are not alone, you are not alone, you are not alone. We are all here to pull each up out of the dark, whether it’s depression, an injury, or hormonal blues from pregnancy, lack of pregnancy or menopause. Know we’re all here for you – and from one girl who’s had to run herself out of “the dark” to another – you can and will do it!!! Thanks, Clove! You’re right, WE can and will get out of it. Last night a friend suggested I read some Epictetus to help me put things in perspective. I had my doubts, but I have to say that it’s really good to remind myself that there’s no use in fretting over things that are out of my control. It’s been raining here in New York for three days and the last two it seemed like Pathetic fallacy (see? book nerd) but today it’s raining even harder and it feels good and clean, like it’s helping me wash away my sadness. Thank you for sharing. If everyone was a runner, I’d be out of a job 😉 Being injured while being down is a great challenge. And I always get mad when people say “other people have it worse”. Yes, they may, but who’s to say your feelings should be discounted?! Here’s to a speedy recovery! I’m sure your tech savvy-ness with the site is another coping skill to have while injured. You rock! Grab another hug being offered to you from this part of the country. Depression is no joke and you shouldn’t feel like you need to justify why you feel so down. You just do – and that is okay. Best wishes to you in overcoming it and finding your happy self soon! Thank you so much for your honesty and sharing this personal story with me and all of our readers. Depression still seems like a dirty word even though so many of us have battled it at some point in our lives and by talking about it we can make it better. LOVE YOU!!! Thanks, big sis, I love you too! I couldn’t have gotten through any of my dark times without your support, and I can’t thank you enough for guiding me through with your own experience. I just know that there’s someone out there who is like I used to be, who might not have good running friends, or is kind of shy, or is afraid to show weakness or ask for help when she needs it. If that’s you, I just want you to know that you’re not alone, but more importantly that there’s a way you can help yourself even when you feel like nobody is there for you. You can drag yourself out of bed, lace up your shoes and go outside. And failing that, you can always email me. Even if we’ve never met, even if we have and you’d rather remain anonymous, my hotline is always open. depression is also something that reared it’s ugly head when the winter darkness settled over northeast Ohio, complementing the already gray daytime skies. you’re absolutely right about running alleviating those feelings and making everything a little more focused and manageable. running all year, rain, snow, or scorching sun, finally seems to make all but the most tragic events bearable. one thing i noticed is that you said running races kept things at bay because you had a goal and something to focus on outside of your current malaise. can i suggest, since you are working through an injury, that you use the down time to support your fellow runners and/or events? maybe crew for someone doing a 50- or 100-miler, or work a few aid stations? i had not thought to do it until only last year but now, i get a great deal of satisfaction out of it. that’s exactly it, yes. %^) there must be so many opportunities in NY. chatting with others about their events and goals can also fine-tune what you will do when you’re feeling up to it. i’ve discovered an official unofficial double-marathon for the Blue Ridge Marathon. i would like to do it next year. only found it because of another friend talking it up as the hardest one in the States. who knew? So Cinnamon, how could you tell Mike was a hasher from his comment? I need to understand this hasher stuff! oh, not a “hasher” formally. never part of a crew or went on a run like that. i only said i was a drinker with a running problem and it seems to somehow have become reversed. ;^) hah! haha, I was just about to ask if Mike was a hasher 🙂 and I loved your post… I’ve never been professionally treated for depression or anxiety but my mom has, and I definitely consider myself a crazy emotional person… but running helps SO MUCH. I wish I had better advice for you on how to cope in this time of injury but I haven’t been there yet, although I am always paranoid about getting hurt for that very reason – but I do like the volunteering idea! Hey Cinnamon — I completely understand what you’re saying. Sometimes life is crap, and we just have to use the tools we have to deal with it. It’s been seven months since your post — I hope you’re doing better. Thanks, ToolGal! There are always ups and downs when you have chronic depression, but luckily as I get older and come to understand myself and the world around me better the ups and downs seem to get less and less severe. Things are up lately, for sure, but when they go down again I know I’ve got a great way to cope in running. Thanks for reading; I hope running helps you find balance the way it does for me!